Moved but far from done! After a full week of non stop moving and cleaning, we can breathe today. We have made our big move and are in our first home. Our family is so happy and excited to have our own home. Unfortunately the real work has just started. We have lots of projects ahead of us but it will be fun. Now to pick out paint colors and put up decor. Not to mention trying to organize and reorganize until I get a good system down. We went from a tiny cozy house which was older with a bunch of built-in cabinets and shelves to a little newer home with more floor space which is now empty. On the plus side my new home has a great gas stove to play with. Stay tuned for some great recipes. Thank you all for the patients and faithful reading, I assure you it will be worth the wait when I have a chance to start posting regularly again. Posted in About Me, Around My House and tagged decorating, gas range, gas stove, home decor, house, house painting, Housewife, moving, new home, new house, organizing, packing, painting, picking home colors, unpacking. Bookmark the permalink. Mr.Picky is out-of-town 3 1/2 days a week, every week. Not the most ideal schedule but it works for us. This means that I am left with our two children alone for that period. Not that I am complaining, I love my children. When Mr.Picky comes home we treat it as a weekend, and usually have a lot of family time. I often wonder what Mr.Picky thinks I do all day? I am not a stay at home mom who sits around, in general I am a get it-done kind of person. I enjoy keeping our house clean, the kids active and thinking, and cooking. Although it is not as fun to cook when he is not home, because I just make way too much food. Routine is everything to me, and the other day I realised that my children appreciate this routine. Some may think it is bad, but it works for us. Don’t get me wrong we can be spontaneous as well. I love to wake up and say we are going somewhere new today. In general we go through the same routine daily while dad is gone. When he is home we might stray but not too far from any other day. First thing when we wake up it is “first breakfast” they call it, usually dry cereal or banana followed by a bit of cartoons. By this time I am able to make some coffee and fuel my body with caffeine I start some laundry because if you just do a load or to a day life is just easier. Next the animals are waiting for their breakfast. We have a Nigerian Dwarf goat named Finley and a male cat name Mia (we thought he was a female as a kitten and the name stuck). Before I know it, it is time for “second breakfast” which is required to be hot. This varies from oatmeal, to scrambled eggs and toast. At this point I check the computer for anything that is important before bathing and dressing the children. If I am lucky at this point they will be playing together nicely and I will get my workout in. If my 20-month old decides it is an adventure kind of day, well then I guess my workout is going to wait until nap time. I try to pick one deep clean area a day in my tiny home, and work on that before I shower. Floors are my cleaning habit if that is what you want to call it. I sweep multiple times a day and sometimes vacuum twice depending on the toddler. Other than that my general rule is if you see something out, put it away right then. And for everyone’s sake clean up after yourself, you get it out pick it up or wipe up your mess. I know Mr.Picky gets a little crazy with me sometimes but it is better than living in filth. Dishes are probably my favorite thing to do, which is good because I cook a lot. I spend most of my day looking out the kitchen window with my hands in the sink. Some wonderful flowers and birds eating from the feeder give me something to look at. I keep our dishwasher empty all the time and load the plates and cups as used. Not a big fan of washing anything but that in the dishwasher; everything else is done by hand. Cleaning the shower is my most hated task, which just will never magically get done. Sometimes the tough things make you stronger. After the chores are done, well it would be time to eat again. We will have a snack and play a bit. Followed by lunch and nap time. Nap time allows me a little peace and quiet to regain my composure. Although it also gives my daughter and I some alone bonding time, seeing how she no longer naps. Once everyone is awake and happy, we usually will try to go outside depending on weather. But seeing how we live in the Pacific Northwest where it rains 75% of the time we have lots of back up plans. Our local library is something we take full advantage of. Home again or inside it is time to prepare dinner, and sit down at the table as a family. This is so important to me, and rarely changes. Then it is time for some pajamas and story time. I am lucky enough to say my kids go to bed early in order to get a full nights sleep. Now mommy time begins. I take the rest of the night to finish any projects needing finishing, read a book, blog or watch a favorite show. Now I know this doesn’t cover my whole day but you get the idea, my day never ends. At some point not too long after the children fall asleep I crawl into bed because I can no longer stay awake. This is what I do all day, and now Mr.Picky you know. We work hard in different ways but working for the same goal. Our family functioning and development is depending on us. Thank you for being the best partner that one could have. Posted in About Me, Around My House and tagged cleaning house, Family, Home, Housewife, Parenting, Picky, stay at home mom. Bookmark the permalink. We eat a lot of fresh fruits and vegetables in our house. 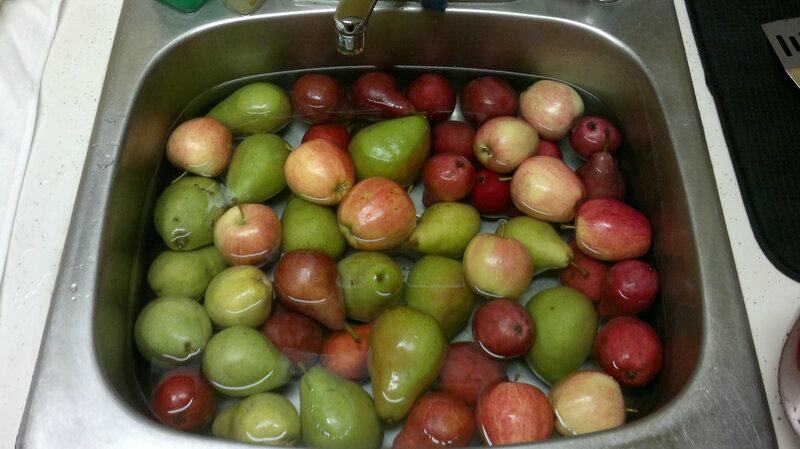 I have found using 1 cup vinegar to a sink full of fruit, for about 30 min. can really remove a lot of waxes on fruit. After soaking, I rinse and allow them to dry. Eat fruit it’s good for you! Posted in Around My House, Vegetables/Sides and tagged food, fresh fruits and vegetables, fruits and vegetables. Bookmark the permalink.